All classes require a sewing machine and basic sewing kit. Sign up for Fall Retreat is Saturday, June 1st, 2019 at 9 AM. In store sign ups from 9-10. Phone sign ups will start at 10 if there are any remaining spots! Mark your calendar to be here to sign up, spots go fast!! Fall Quilt Retreat at Green Lake Bible Camp is November 10th-13th/14th, 2019. Four days and three nights, meals included…or stay one extra day and leave on Thursday, November 14th. (we will need a minimum of 10 quilters to stay one day longer) By popular demand, we’re offering a 5 day for those who want to stay longer. Friday, March 29th ~ 9:00 a.m. to 5:00 p.m. Shake off that cabin fever and get out of the house for some fun! 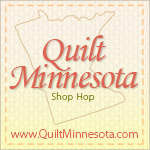 Come see the trunk show for our new book “Quilts Made Easy”. Pick up a copy of our 25th book to add your collection. Come enjoy a day out! Get inspired and enjoy some Spring fabric…even though it may not look like Spring outside. Sign up for Spring Retreat is Monday, October 1st, 2018 at 9AM. Sign up starts at 9 am via phone or in store. Spring Quilt Retreat at Green Lake Bible Camp is March 10-13/14 2019. Four days and three nights, meals included…or stay one extra day and leave on Thursday, March 14th. (we will need a minimum of 10 quilters to stay one day longer) By popular demand, we’re offering a 5 day for those who want to stay longer.